“After the wipe and before the dipe, use a soft kiss of cloth to dry bums off. Keep diaper rash at bay, the Bummas way.” Catchy little saying right? I am sure we have all be faced with diaper rash, and lots of advice on how to treat it and prevent it. One thing I learned is you have to dry the bum area before putting another diaper back on. Had I had the Bummas 2.5 years ago I wouldn’t of had to use a blow dryer or blow on Sadie’s bum to speed up the process. 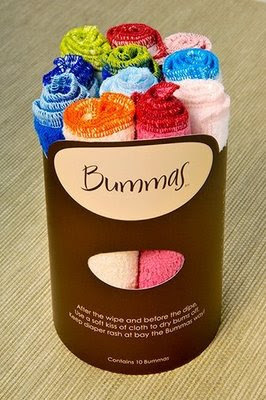 Bummas come in packs of 10 for $16.99 in four colorful combinations. You can choose The Wild Ones, The Boys, The Girls and The Calm Ones. Go to www.bummas.com to see the color selection online. They are made in California of 100% cotton woven velour terry cloth and won’t pill, shrink or fade. They are the prefect size for little bums and I used mine on Sadie and they were still a great size. Now Sadie isn’t in diapers but I sometimes need to try off her area for creams and lotions and they worked fast and did a wonderful job. I loved them!!! They are soft, eco friendly and made especially for drying baby bottoms as well as blocking those surprise squirts. A great gift for a new mom or a pro mom. Something to add to your collection of must have baby products.